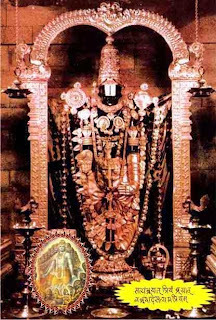 Continuation of the story of Lord Venkateswara of Tirumala after Part-I. 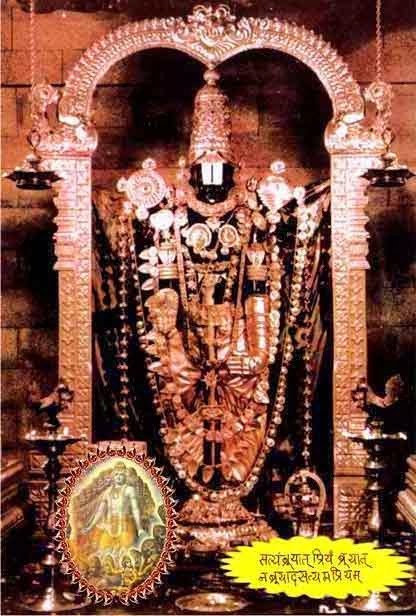 Lord Venkateswara decides to stay in this place which is known by the name 'Varaha Kshetra'. According to 'sthala purana', Sri Varaha Swamy (the wild boar incarnation of Lord Vishnu) who decided to stay at this place (Tirumala) for sometime after He kills Hiranyaksha and re-positions Earth. Thus Sri Varaha Swamy becomes the 'Kshetra Palaka' of this place i.e the ruler of the place. Lord Venkateswara seeks Sri Varaha Swamy's permission to stay in His 'Kshetra'. Varaha Swamy happily permits Lord Venkateswara to stay in 'Varaha Kshetra' and bows down before Venkateswara who blesses Him saying that as Varaha Swamy is the ruler of the place, the devotees should first have the darshan of Varaha Swamy and then go for the darshan of Venkateswara Swamy. Lord Venkateswara with the bleeding wound on His forehead walks with pain in search of a shelter in the forest. He reaches the hermitage (kutir) of Vakula Devi and seeks refugee at her shelter. As per 'Sthala Purana' Vakula Devi is none other than Yashoda (the foster / adoptive mother of Lord Krishna - one of the incarnations of Lord Vishnu) in her previous birth. Yashoda nurtures Krishna with much love and affection and enjoys His childhood naughty acts / deeds. As a mother she could not perform His marriage, so she develops a strong desire to perform His marriage. Lord Krishna promises her to fulfill her desire in her next birth when He takes refugee with her in a different form. Thus, Yashoda is reborn as Vakula Devi and eagerly waits for the arrival of Krishna in a different form. When Lord Venkateswara calls out 'amma' (mother) at her doorsteps with pain, seeing the radiance on His face instantly calls Him 'Srinivasa' (the residing place of Lakshmi i.e Sri / Siri). She identifies Him to be Krishna (Lord Vishnu) and rejoices the home coming of her dear son. She nurtures Him with motherly affection / feeling and thus Lord Venkateswara stays with Vakula Devi for sometime. During His stay Venkateswara goes for hunting in the nearby woods / forest and chases a wild elephant. The two of the enter into the palace garden of Akasa Raju where Princess Padmavati - the daughter of King Akasa Raju and her friends were playing. 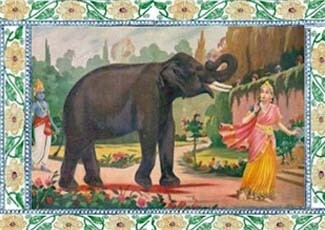 At the sight of the wild elephant Princess Padmavati gets frightened and runs for rescue. She is saved by Lord Venkateswara and thus there is mutual exchange of divine love and affection between Lord Venkateswara and Goddess Padmavati Devi. On returning to His hermitage, Venkateswara is lost in the sweet memories of His encounter with His sweetheart. On seeing this, Vakula Devi inquires, "Dear Srinivasa, why are you so dull?" Lord Srinivasa replies, "Amma, I'm in love with Princess Padmavati. In my earlier incarnation as Rama, I promised Her that I would marry Her in my next incarnation. And now I have to keep my promise." Vakula Devi then questions Him, "What was the previous birth of Padmavati and what's the story? Explain in detail, dear Srinivasa". Srinivasa explains, "In Treta Yuga, when King Ravana was about to abduct Sita Devi during the absence of Lord Rama and Lakshmana, Agni Deva (fire god) in view of rescuing Sita Devi, creates an illusory Sita i.e Maya Sita with his yogic powers. Maya Sita was abducted by Ravana and endures the tortures of Ravana in the Ashoka Vanam in Lanka. Agni Deva entrusts real Sita Devi to his wife Swaha Devi and thus rescues Her from being abducted by Ravana. After the killing of Ravana by Rama, Sita (Maya Sita) was asked by Rama to prove her chastity by entering into the fire. As Maya Sita enters fire, real Sita is brought back by Agni Deva. Rama is perplexed on seeing two Sitas and asks who is the other lady. Real Sita explains that she is Maya Sita who endured all the tortures of Ravana. She then asks Rama to marry Maya Sita but Rama refuses as He vows to have only one wife in that (Rama) incarnation. He promises to marry her in her next birth as Padmavati when He will descend on to Earth as Srinivasa. Thus Maya Sita is reborn as Padmavati - daughter of Akasa Raju - while Vishnu came on to Earth as Srinivasa. Note: There is a different version of the story according to which it is Vedavati who is born as Padmavati. Srinivasa then says, "Amma, I have to keep my promise and marry Padmavati. And you have to initiate for the proposal." Read Part - III - the story of Srinivasa Kalyananam.